Acne can be disfiguring, demoralizing and frustrating! It is common during adolescence but can strike anyone at any age. Acne symptoms can range from an occasional zit to painful cysts. If left untreated, it can often result in permanent scarring. Acne scarring is difficult and sometimes impossible to erase. Much, however, can be done to control acne and prevent acne scarring. Do you have acne? Do your kids have acne? If so, we would like to give you something to think about. So shouldn’t we do what we can for Acne? The confidence that comes with having clear, smooth, blemish-free skin is at least as important as a nice smile, don’t you think? The value is comparable but the cost is far less. 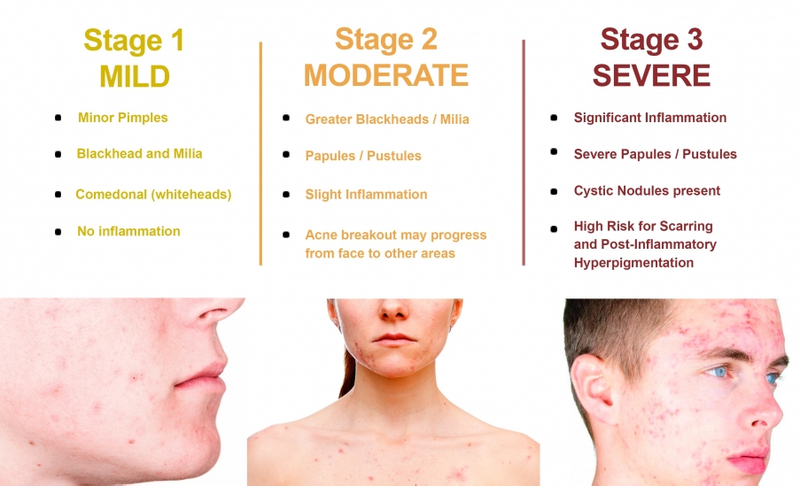 The skin condition known as Acne Vulgaris is classified as Grades 1 through 4. We treat Grades 1 to 3 at Skinpossible. Excessive production of oil from the sebaceous glands, blockage of the oil glands at the base of hair follicles, and the presence of the Propionibacterium acne bacteria are the main causes. Many factors can contribute including the presence of dead skin cells that can clog pores, inflammation, hormonal fluctuations, food intolerances, environmental factors and more. Use of the wrong skincare, contact with unsanitary materials (such as helmets, shoulder pads, dirty make-up applicators, pillowcases), and other factors including stress may also contribute. What are the possible solutions for Acne? Depending on the degree of acne you have, getting rid of it may be as simple as eliminating the factors that are contributing to its development. Additionally, any or all of the following can be employed to treat various grades of acne and acne scars. Skincare products to lift impurities, remove excess oil and balance the skin is the first course of correction for all grades of acne. Why medical-grade? Because the active ingredients in medical skincare will always be more efficacious and the percentages higher than what can be found elsewhere. Peels can reduce acne symptoms and help smooth the skin at the same time. Chemical Peels for acne include a salicylic acid to kill P-acnes bacteria and glycolic acid to remove dead skin cells and relieve congested pores. The peels used at Skinpossible can be customized with additional ingredients to help with inflammation and lighten post-acne pigmentation. This medical facial uses patented vortex tips to infuse acne specific solutions. At the same time vortex suction gently extracts blackheads, whiteheads, and other impurities. Blue light therapy can be added to the treatment to target porphyrins that live inside acne bacteria and produce free radicals to kill the bacteria. Lasers can be used to penetrate the skin without injury to target porphyrins and thermally suppress the sebaceous glands which are responsible for causing acne. This is a great way to expedite the clearance of acne. For more severe acne prescription antibiotics may be required to target the acne systemically. Prescription Vitamin A can also help. Retin A changes the responsiveness of the skin to stress, helps the skin adjust to hormonal fluctuations, stops excess sebum production and speeds up the growth of skin around pores. The same breakthrough laser that can remove tattoos in record time works to break up the pigment in the scars and the scar tissue itself. This non-invasive treatment exfoliates the skin from the inside out while stimulating a healing response and collagen remodeling. Moderate to severe acne scars can be improved with one or more of this more aggressive treatment that involves 5 to 7 days of downtime. Clear smooth blemish free skin will give you a reason to smile! Acne consultations, like all consultations at Skinpossible, are free. If you would like to learn what can be done for your acne or acne scars call and schedule a time to learn about the options.